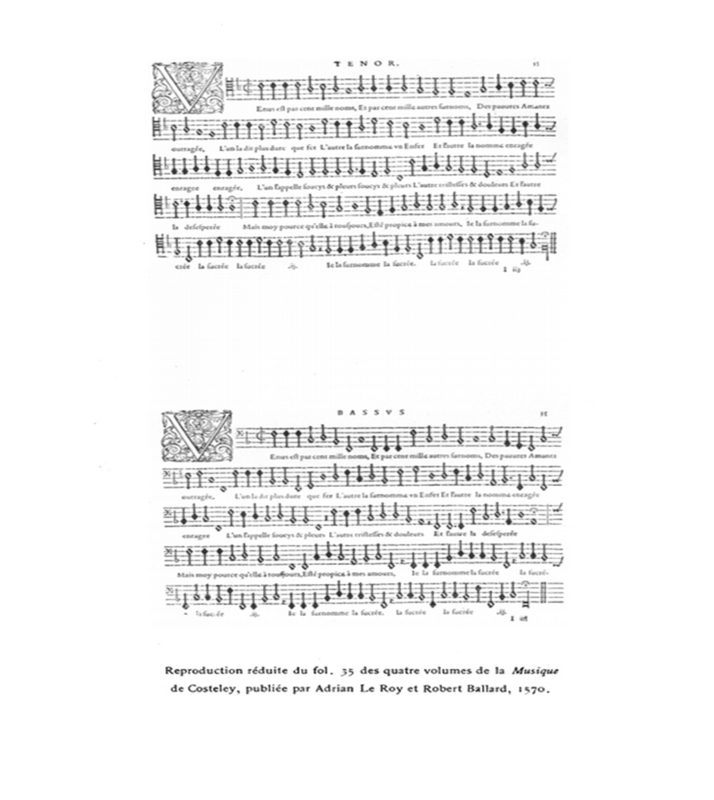 Costeley was part of Baïf’s Academie de musique et de poésie, and coincidentally born in the same part of the Auvergne as Bertrand and Boni. 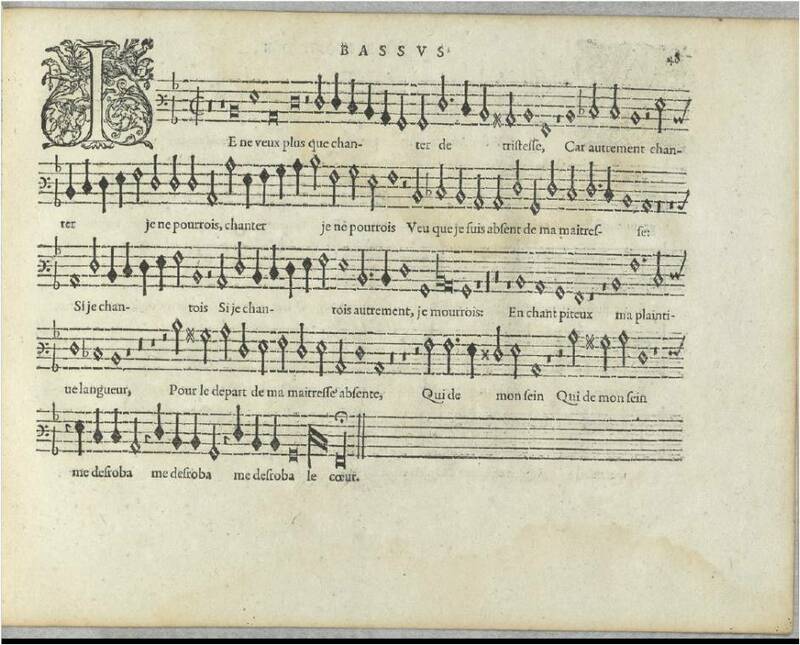 Unlike them he followed a purely musical career, as royal organist when Charles IX was on the throne, and is famous for his many chansons. 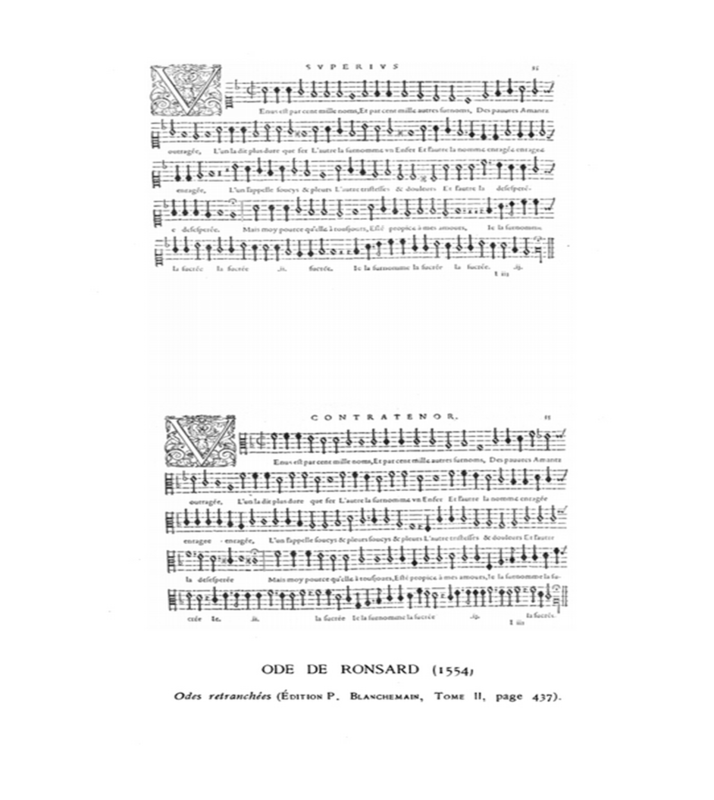 Not so many of them were to texts by Ronsard, though – only 6 of the 100 or so surviving songs. 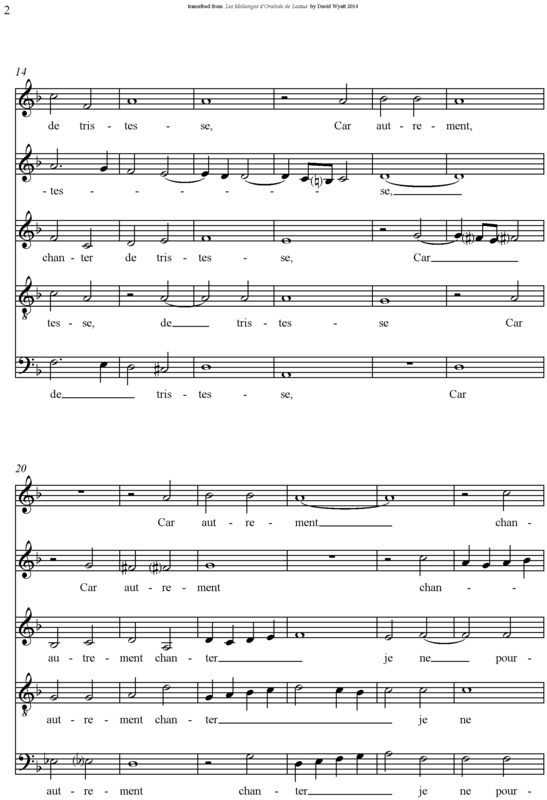 A remarkably homophonic song, not many accidentals, and really no chromaticism at all – a nice easy piece to transcribe. The recorded extract, the opening half-dozen lines, demonstrates this neatly. 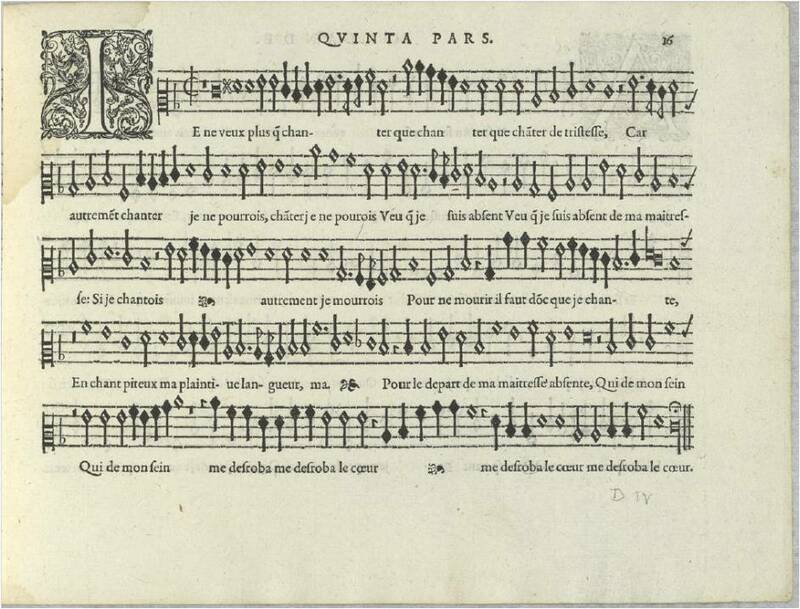 The last of the early pieces from the 1552 edition of the Amours: this is a setting of the Ode which made Ronsard’s name, the monumental Ode to the Chancellor of France. 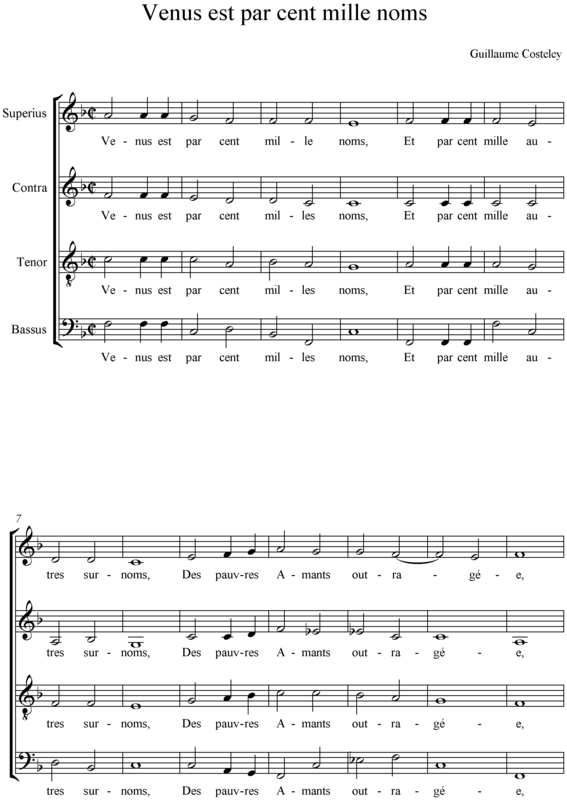 Goudimel’s setting is remarkable for the low voices: all four voices range over no more than two-and-a-half octaves, and the distribution is alto-tenor-tenor-low bass – though the first tenor has a rather higher tessitura in the Epode.The recorded extract uses a viol consort to realise the lower voices, with a single voice above – I’ve chosen the opening quatrain, showing the artfully-varied repeat of the opening music in the second couplet. 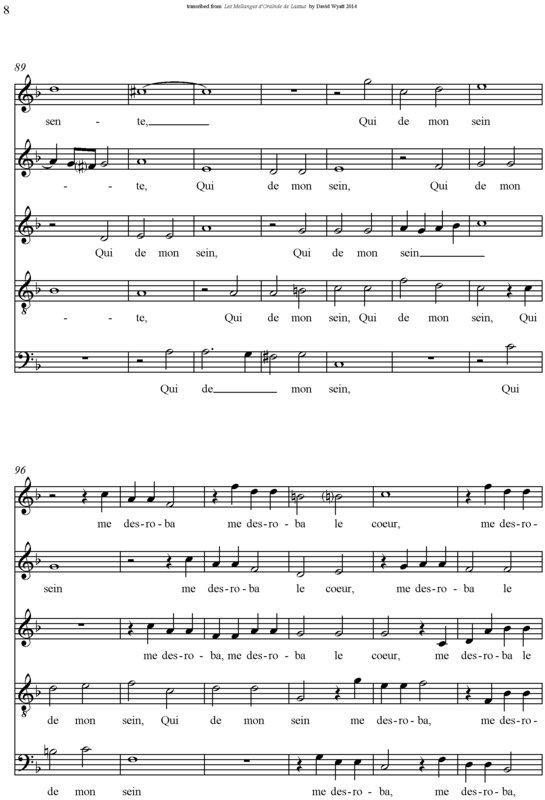 Goudimel seeks to match Ronsard’s objectives in his setting: for instance, the music of the second couplet reflects, but is not identical to, that of the first; he (mostly) avoids repeating words or lines; he re-uses small melodic motifs in the same way that Ronsard uses internal rhymes, alliteration, etc to bind the song together. 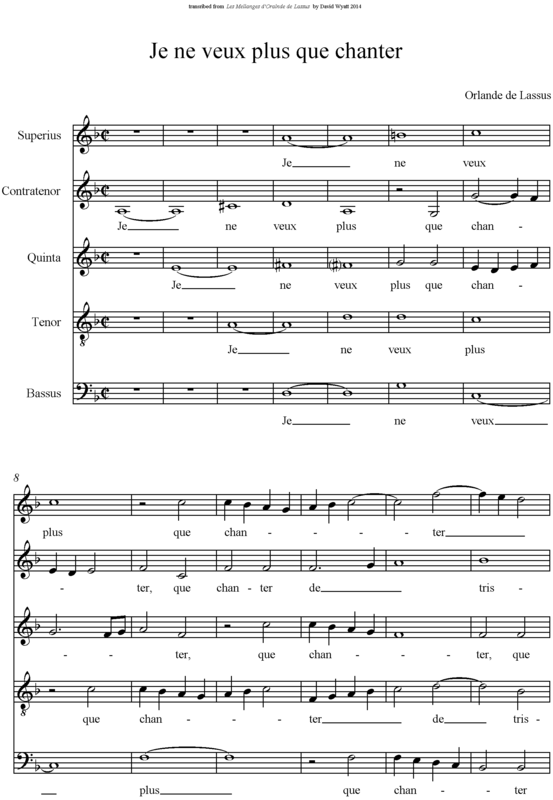 And of course he provides a setting which mirrors the classical form used by Ronsard – a strophe whose music is repeated for the anti-strophe, just as the rhythms and rhyme-scheme of the strophe are repeated in the anti-strophe; and then a concluding epode which rounds off the setting. 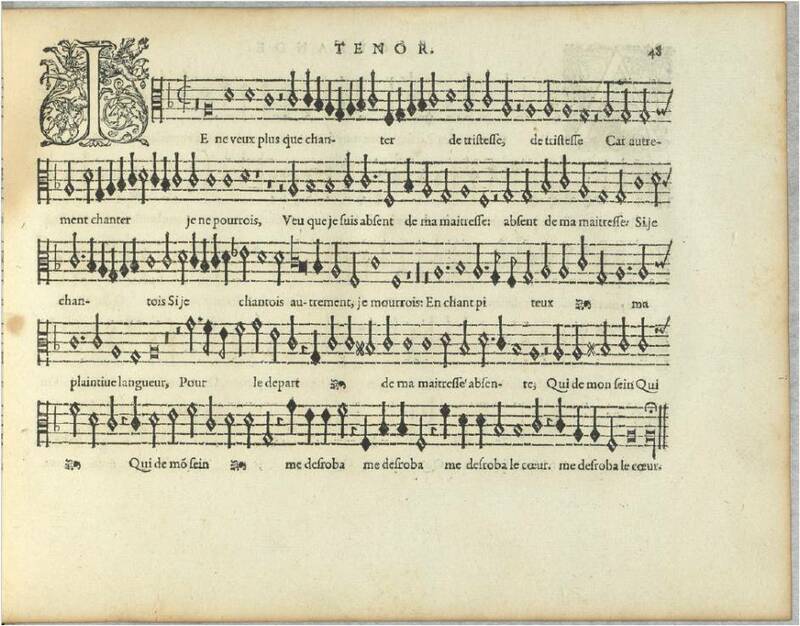 The helpful 1552 editor suggests that anyone wishing to sing the entire Ode (!) 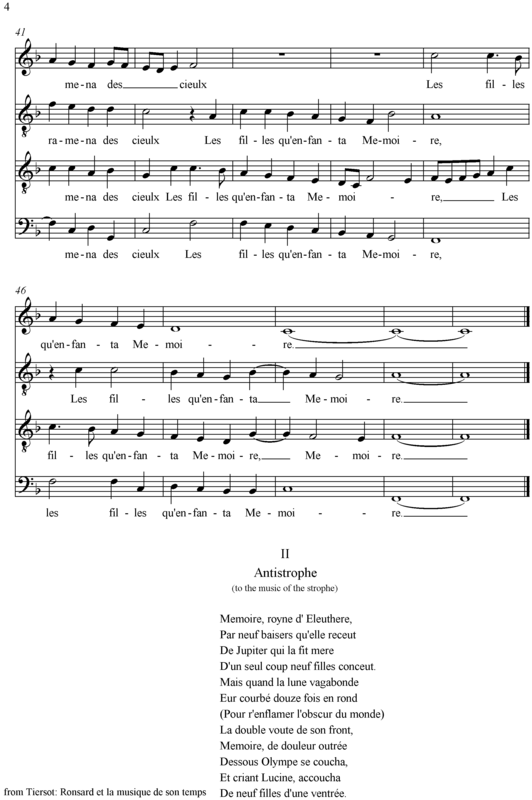 should simply repeat the 3-verse musical setting as many times as necessary: Ronsard’s text allows this, but as there are 24 sequences of strophe-antistrophe-epode in the poem, and the sequence takes around five minutes to sing, singing the whole ode would take something over 2 hours! 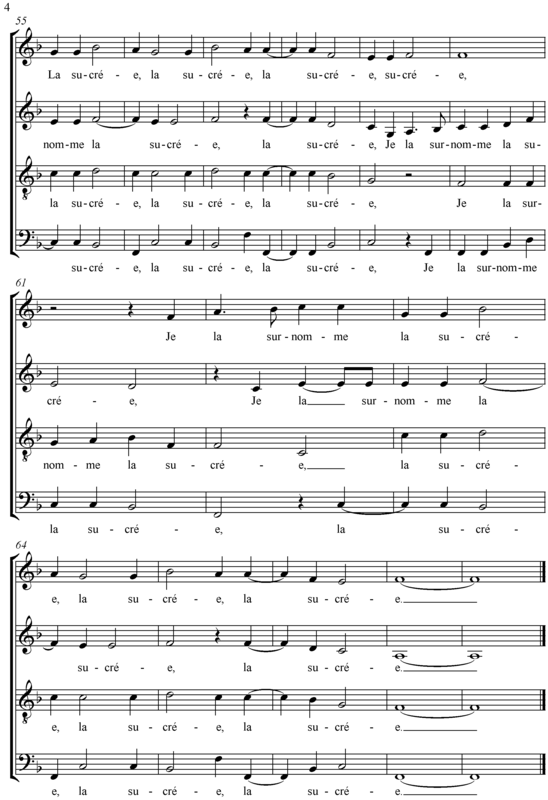 In transcribing Tiersot’s version, I have taken the liberty of normalising the text underlay in a few places to fit the ‘standard’ rules; though Goudimel doesn’t help (especially in the epode) by regularly having one more note than he has syllables! I’ve kept the halved note-values Tiersot uses. Aux champs de Mars donnerent à Jason. Si tendre qu’elle en la prime saison. Et qu’une part se vient rendre au veinqueur. By force to Jason in the fields of Mars. Is so tender as this early in the season. And one part has just handed itself to the conqueror. My, what contorted grammar throughout: quite often you have to read two or three lines before the meaning emerges clearly. 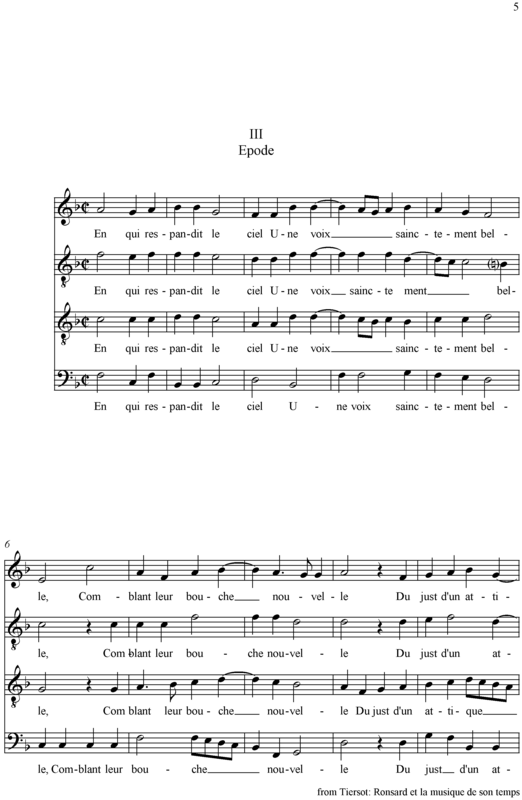 The opening for instance: “si blond si beau” could easily mean ‘She’s as blond as she is beautiful’ – but then line 3 forces a re-think. The references are almost simple by comparison: Jason of course gained the golden fleece – but not directly from the bulls. It was Aeëtes (Medea’s father) who promised him the fleece if he would just plough his fields using the fire-breathing, brass-hooved bulls); and the result of ploughing the fields was not winning the fleece, but reaping the fruit of the dragons’ teeth, an army of soldiers. Only then, and after further skullduggery, was Jason able to obtain the fleece (by theft!) ‘By force’, incidentally – though Ronsard’s usage is no less ambiguous – means that the bulls were forced by Jason to do his will. The second quatrain refers to the fabled qualities of Tyrian purple – again, Ronsard’s image is deliberately oblique, since it was the colour of Tyrian cloth, not its innate qualities or those of its workmanship, that were valued. (Tyrian purple was a dye extracted from sea-snails, which actually improves its colour and brightness with exposure to air , rather than fading. It is estimated that “twelve thousand snails of Murex brandaris yield no more than 1.4 g of pure dye, enough to colour only the trim of a single garment.” No wonder that purple sold for its weight in silver. It is this value that Ronsard indirectly alludes to: though inevitably only the finest cloths, too, would be dyed with such expensive colour. Here, “Tyr” is the city of Tyre (hence, ‘Tyrian’ (or Phoenician) purple), no relation to the Norse god of the same name. 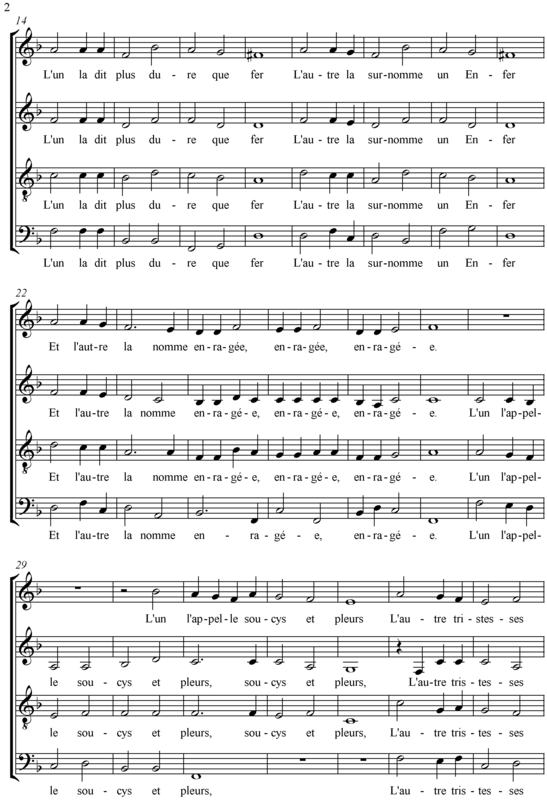 In the earlier version Blanchemain prints a minor variant in line 5 “qui Tyr ont esleu …” (‘those who elected to live in Tyre’); and a different form of line 9 “Poil folleton où nichent mes liesses” (‘Wild hair where my joys lodge’). He adds an admonitory footnote, that this sonnet is not about Cassandre, i.e. that Ronsard ‘re-used’ an earlier sonnet. 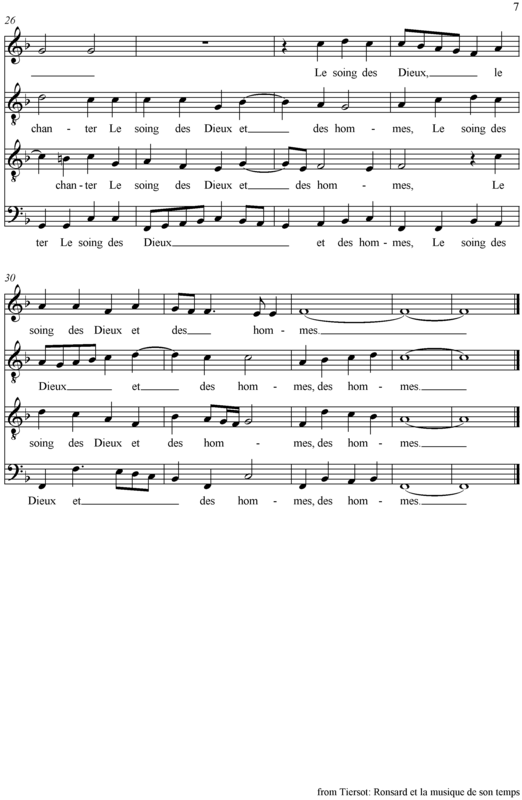 Finishing the selection from Lassus’ Meslanges is this attractive setting. 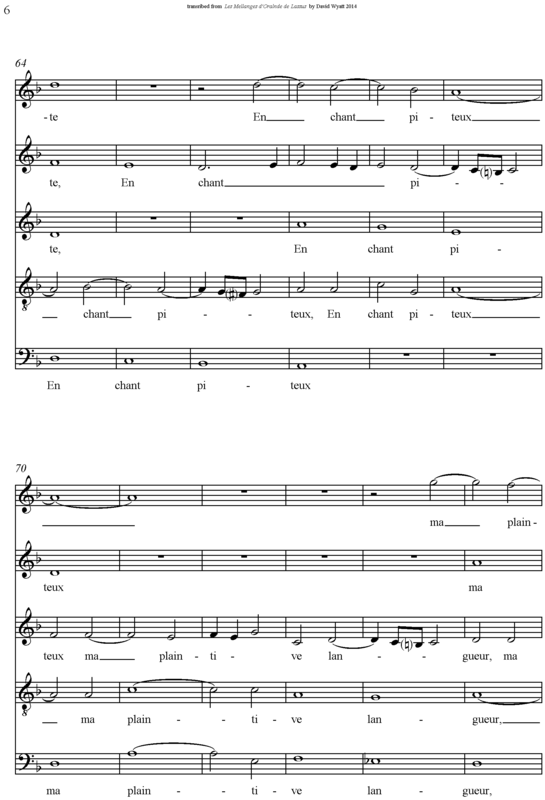 Lots of imitative writing throughout, as well as recurring little melodic & rhythmic features tying the whole piece together. 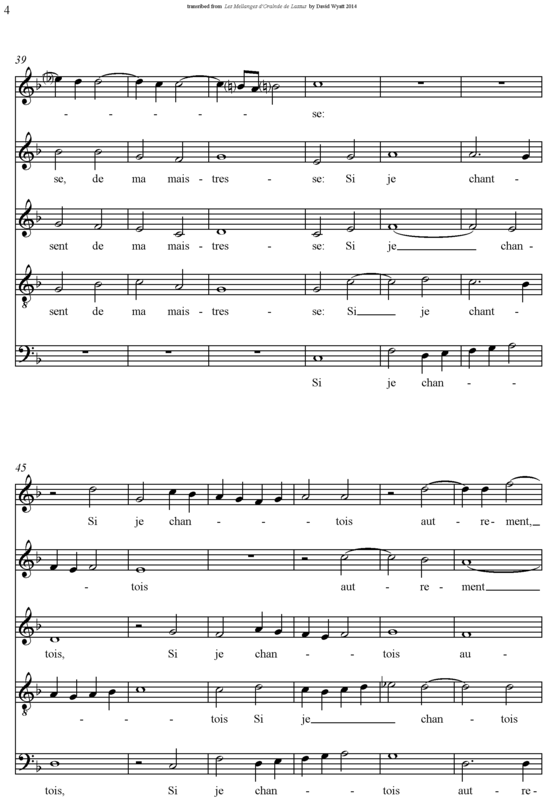 Inevitable melismas on “chanter” (‘sing’) throughout as well. 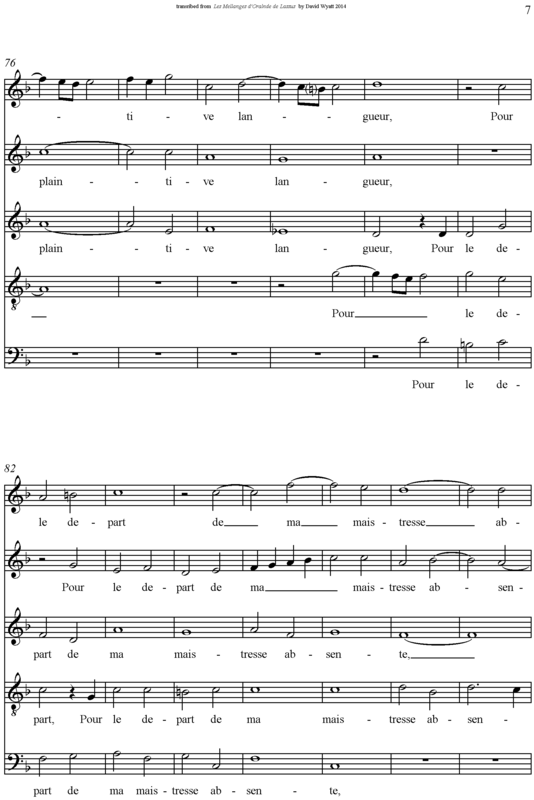 I particularly like the way the texture shrinks to just the high voices at bar 56, then at 63 the two lower voices emphasise “en chant piteux” (‘in piteous song’) by descending stepwise out of time with each other, generating some painful discords on the way. 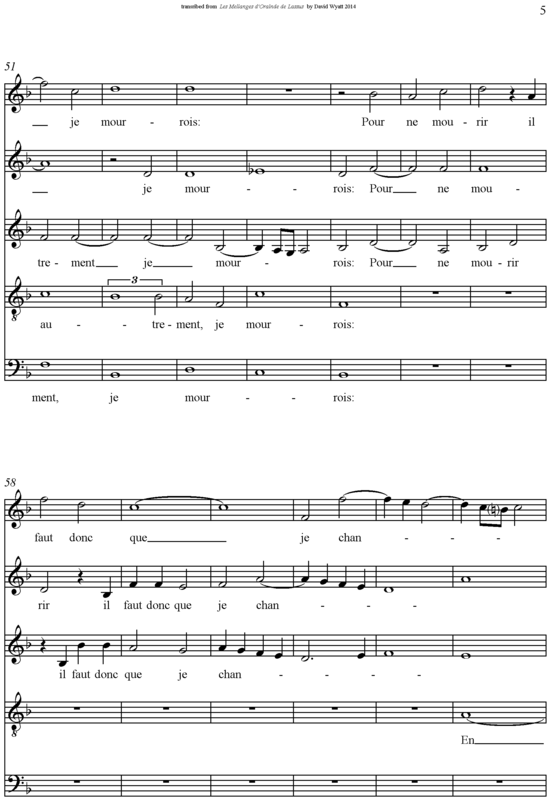 Also unusual is bar 52 in the tenor, with a couple of ‘black’ notes in the original indicating a quick switch into and out of triple-time: I’ve used a triplet rather than writing a 3:2 time-signature for just one bar. Que de tourmens dans mon cueur sont enclos. Du coup mortel qui m’est si doux au cueur. Blowing a fire which burns me to the very bone. As there are torments shut up in my heart. By the mortal blow which is so sweet to my heart. 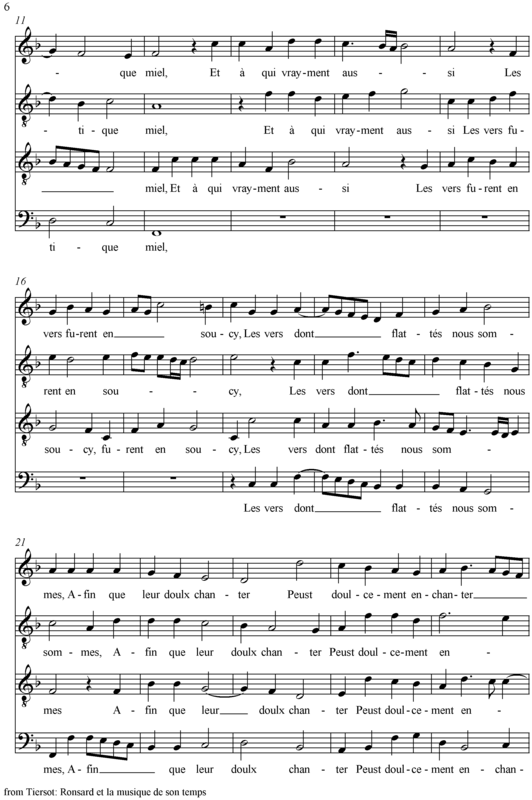 In the second quatrain, Africa is (in classical & Ronsardian terms) essentially desertified north Africa. Boreas, the north wind, of course brings storms when he blow: note that Ronsard converts the adjective ‘horrible’ into a verb ‘[make] horrible’ – literally, ‘when Boreas horribles his breath more’. 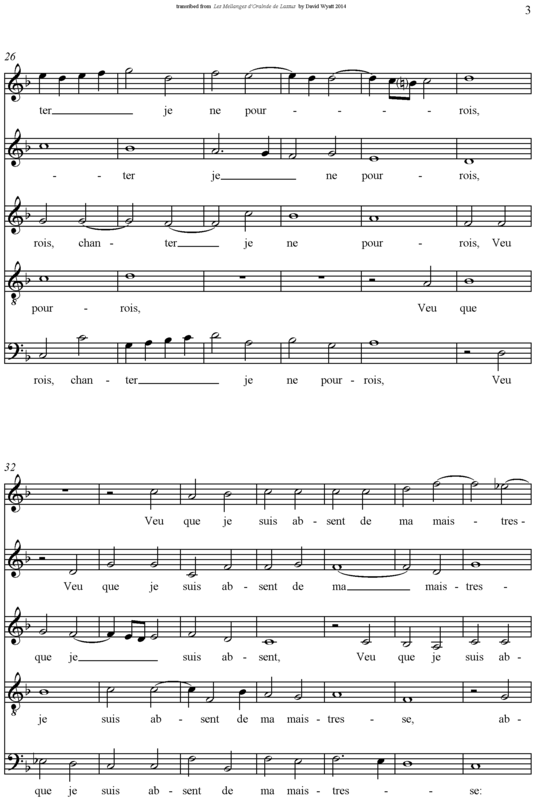 In the earlier version Blanchemain offers some minor variants: line 3 is “Dans chaque nerf et dedans chaque veine” (‘In every nerve and within every vein’), a repetitive form he improved considerably in the later version; and in the penultimate line he has “apres ma mort” (‘after my death’) – later exchanging the alliteration of “ma mort” for (in my view) the less attractive, though also less insistent, alliteration of ‘la … la’. 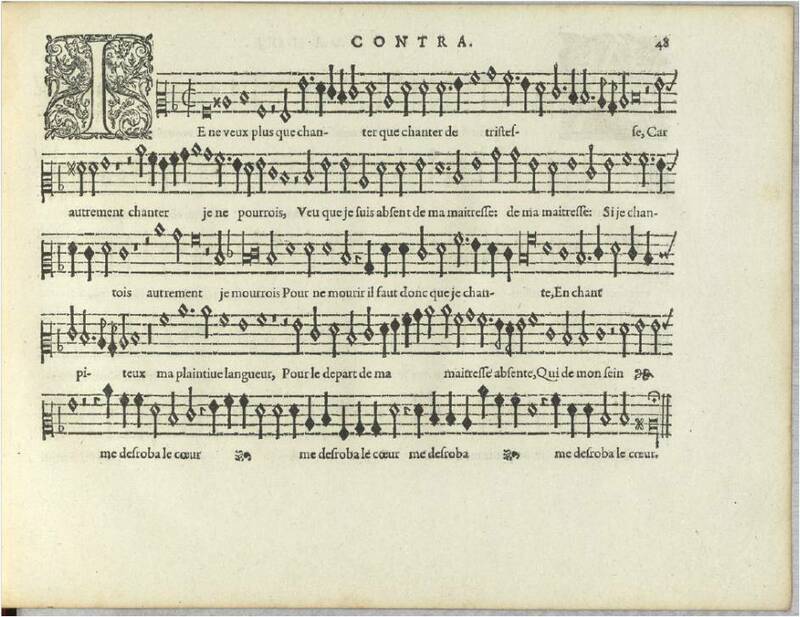 This sonnet follows the previous one, and is a continuation of it: something I don’t think we’ve seen before in this survey of Ronsard’s work. 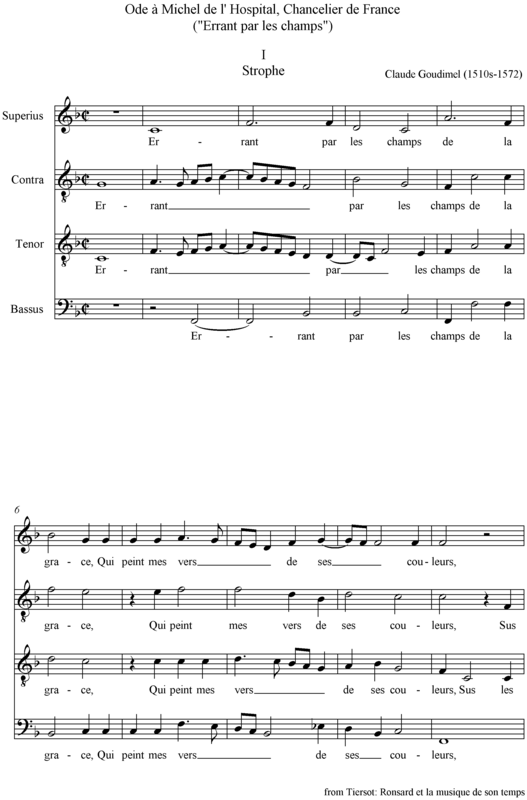 Qui de leur jour la lumiere celoit. Où l’Archerot ses fleches émouloit. Feu ses souspirs, ses larmes un crystal. Which by their brightness hid the light. Where the Archer sharpens his arrows. Her sighs were fire, her tears a stream. 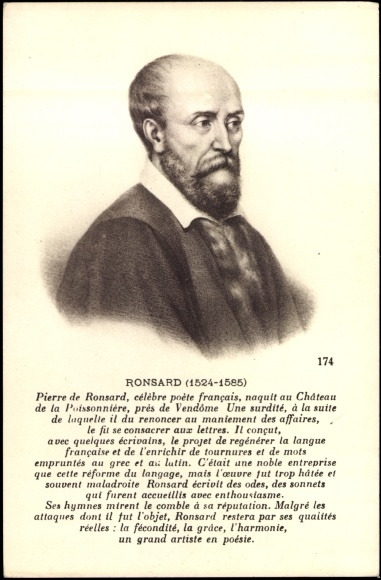 As well as the uniqueness of structure – 2 sonnets as one poem – we have here one of Ronsard’s more bizarre metaphors! 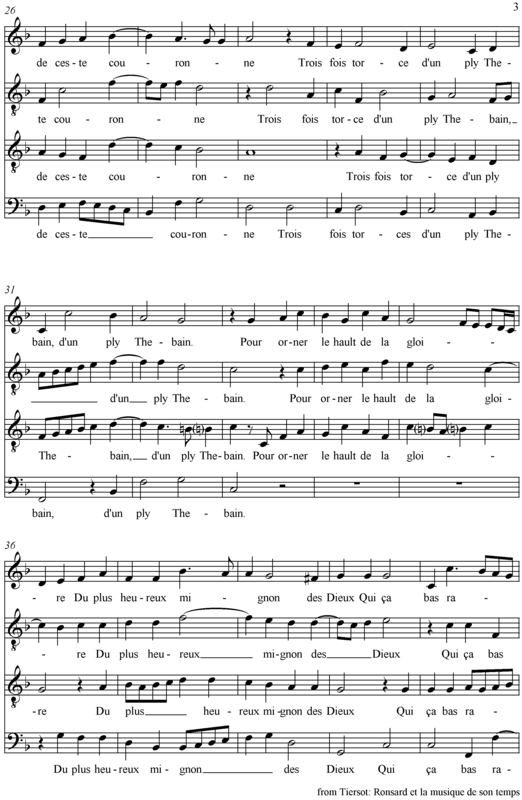 In the opening quatrain, the ‘twin fires … divine flame’ become ‘a hazy drizzle [of rain’, which in turn ‘hid the light’. From bright burning fire to rain and back again, all describing the same thing?! This poem remained unchanged from the earlier to later versions. D’un teint de mort ses graces avoit peintes ! Que les rochers se brisoyent de ses pleintes. Dans le crystal de ses moites œillades. Has painted her grace with the colour of death ! That the rocks split at her moans. In the crystal-clear [drops] in her moist eyes. 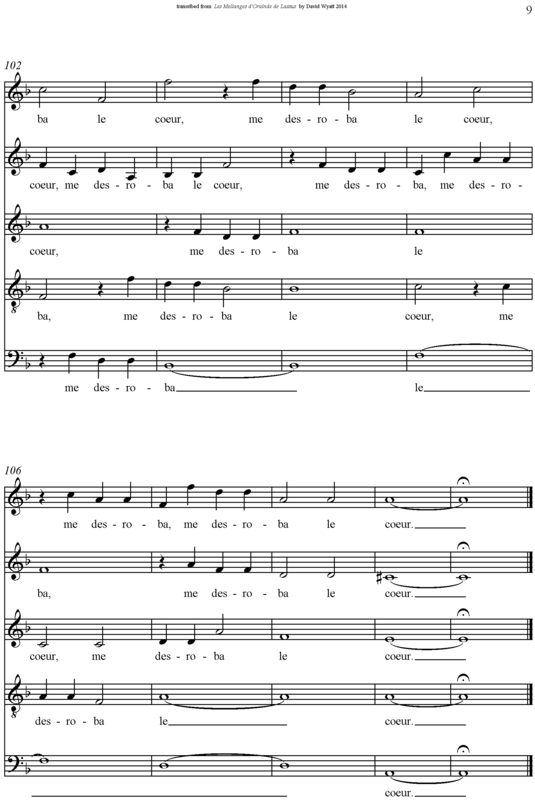 A simple two-section poem, separating into octet and sestet. A good place to set out from anew! In the earlier version Blanchemain prints, there are small changes only, not significantly affecting structure or texture. 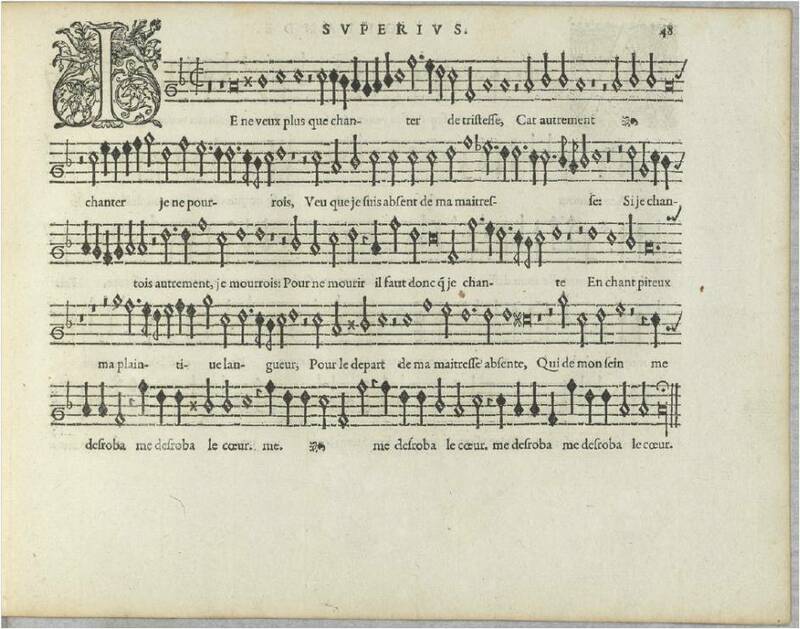 The opening is, perhaps, more arresting: “Mon Dieu ! 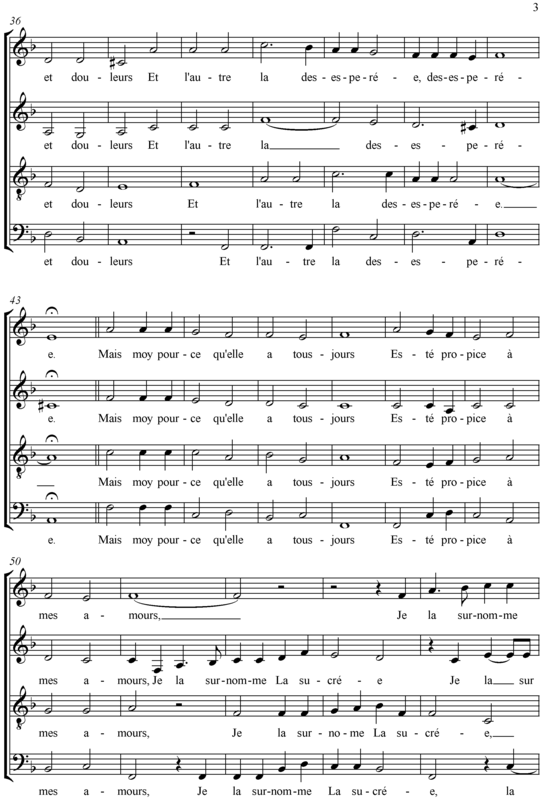 quel dueil …” (‘My God, what grief … !’); line 7, by contrast, clumsily alliterative through mere repetition – “Et, triste, à part pleuroit si tristement” (‘And, sad and separate, she wept so sadly’). 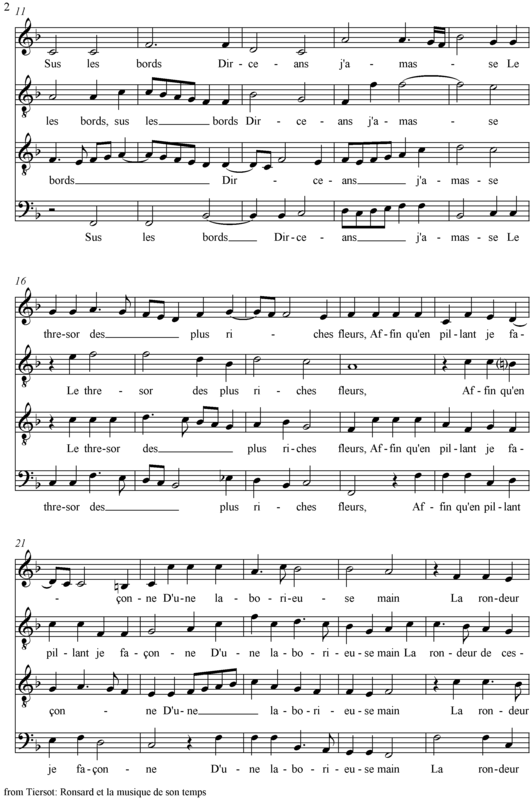 Finally, in line 10, the heavens change ‘their looks’ (“Changeant de front, de grace …”) – alliterating with the “fermez” in the previous line, an alliteration Ronsard later decided to do without.